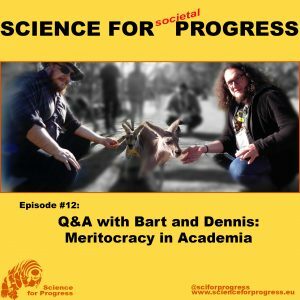 This episode is the first ‘Q&A’ episode, where my new co-host Dr. Bart Geurten (see episode 8) and I talk about what’s new in academia. Our conversations are free form and may lead us astray here and there. We discuss the concept of ‘merit’ in the natural sciences. And we begin with a quick recap on episode 9, where I talked to Dr. Björn Brembs about the Journal Impact Factor (JIF). The JIF is a metric designed to measure the impact a journal had in the scientific community. There are many problems with how JIFs are generated. What is even worse is the misuse of this metric for estimating the scientific ability of a single author of one article published in a journal. Bart tells us about how he himself took the news about how the JIF can be influenced by the journals, and the reactions of his colleagues. The omnipresent use of the JIF is guiding the decisions of our generation and it’s not questioned enough. Björn Brembs had mentioned how the reviewers at ‘top’ journals blocked his attempts to publish an article about how the JIF is created. The reviewers claimed that everybody would already know about this. Based on Bart’s experience, and the feedback I received on Twitter, this is definitely not the case. Bart suggests bypassing commercial journals to reach the community through society communications and similar outlets (for example ‘DZG news’, an outlet of the German Zoological Society). We point out a couple of characteristics which make a successful scientist in our eyes, and talk about the difficulty of measuring these. One metric in use is the Hirsch index, which also uses citations of each single article. In principle, this is one step better than the JIF. But it has it’s own problems, since the potential citations differ widely, for example by accessibility of the paper (open access versus closed access), dissemination on social media, size of the research field the work is directly relevant to, the type of the article (research report, method paper, review article, etc.). And non of these things have anything to do with the abilities of the authors. Our advise for early career researchers: Go for high journal impact factor journals, and apply to ALL of the grants and awards. Apart from that, we think it is important for the scientific community to move away from the JIF and towards new metrics, Open Science, leadership training for postdocs and young principle investigators, and modern team management techniques.